Inside a non-descript concrete building in a Swiss parking lot lies evidence that could take down dozens of Olympic athletes. 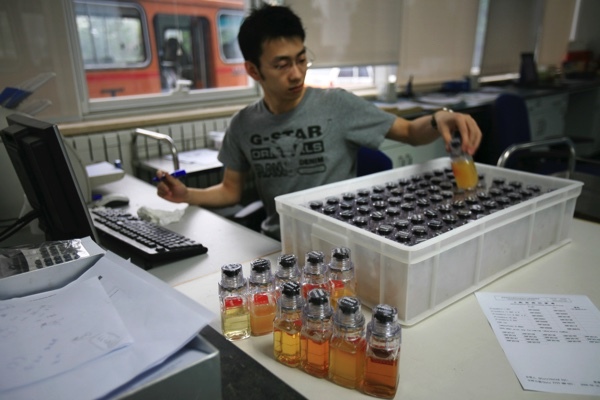 The anti-doping laboratory in Lausanne holds the stored urine and blood samples from the 2008 and 2012 Olympics that are being retested with improved techniques to catch drug cheats who escaped detection at the time and to keep them out of this summer’s games in Rio de Janeiro. It’s officially called the Swiss Laboratory for Doping Analyses, or by its French acronym LAD. It’s one of 34 labs around the globe accredited by the World Anti-Doping Agency and is affiliated with the University Hospital of Lausanne. The lab is located in a drab building near a small Coop supermarket, beside a main road and at the end of the M2 metro line. Visitors have to be buzzed in to take the elevator up the three-story building. The lab director is Martial Saugy, a Swiss scientist with long hair and a soul patch above his chin that gives him the look of a jazz musician. Saugy and his lab have often been caught up in major doping cases. Lawyers for Lance Armstrong tried to undermine Saugy’s evidence about the cyclist’s suspect samples from the 2001 Tour de Suisse. Saugy also met with Armstrong’s entourage ahead of the 2002 Tour de France when he was a witness for anti-doping authorities in their case against the American rider. Samples are divided into “A’’ and “B’’ bottles, and the “B’’ samples are available in case they’re needed to corroborate a positive result in the “A’’ bottle. After those tests, the leftover urine is placed into a cargo container that’s refrigerated, then loaded on an airplane that goes to Geneva. From there, the samples are transported to the lab in Lausanne and stored in a large vault, where they can be stored in a locked freezer at one of two temperatures — minus 20 or minus 80 Celsius, depending on the type of freezers the lab buys. “Chain of custody” is a critical part of the anti-doping process, and every time the bottles change hands, or locations, forms must be filled out to acknowledge who has been in contact with the bottles. A missing link in that process can invalidate a positive test. The limit was recently raised from eight years, which gives scientists more time to identify new drugs, then develop new tests to identify them. Also, scientists can develop more sensitive tests for metabolites — residue — of known drugs that are found in urine. And, if a test for a certain drug wasn’t completed at the Olympics, it can be done in a retest years later. “The anti-doping guys have an arsenal that they don’t make public,” said Tom Brenna, a Cornell University professor and an expert on anti-doping laboratories. An example Brenna gave was the discovery of a test for plastic residue from the bags some cyclists used for EPO-laden blood transfusions. Because EPO has been notoriously difficult to detect, the test for the “plasticizer” gave the drug-fighters a back-door method to prove someone was using the drug. The IOC is notifying the 12 national Olympic committees whose athletes have been caught in the Beijing retests. Names and details have been kept confidential for legal reasons. If athletes are found guilty of doping and stripped of medals, any reallocation won’t take place immediately. The IOC will retest the samples of those athletes who stand to move up in the medals to make sure they were clean.